This is one hell of a story. 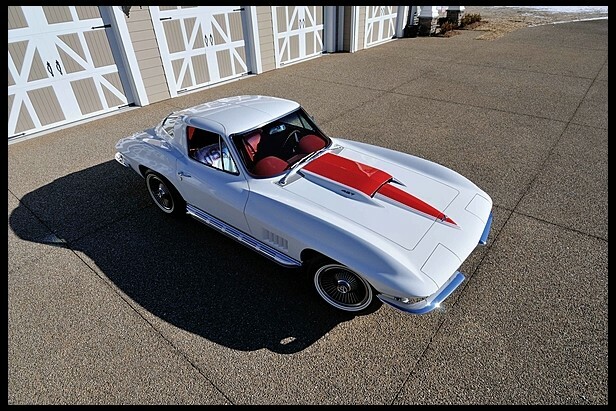 And as though the story itself is not enough we get to see actual pictures of a 67 Vette that are beyond anyone’s imagination considering this car left the factory almost 50 years ago. 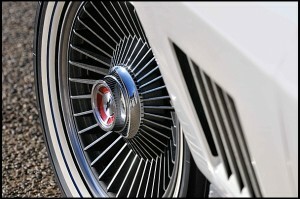 Honestly, if we could travel back to 1967 we’d have to go to the showroom to see anything that looks this good… enjoy. In the fall of 1966, 30-year-old Don McNamara of Colorado Springs, Colorado celebrated his retirement from the United States Marine Corps with a trip to Las Vegas. It was the one and only time he would visit Sin City and it proved fortuitous when Lady Luck intervened and a slot machine Don was playing paid out the massive sum of $5,000. By the time he returned to his parents’ home where he lived, he knew what he would do with his winnings. He asked his father, a car salesman, to take the money and buy a new Corvette. At first glance, Don’s dream car appeared to be just out of reach; the features he specified pushed the price tag more than $500 past the $5,000 mark, but his father’s persistence paid off when he found a dealership in Lamar, Colorado about 125 miles away, that agreed to sell a 427 coupe for under $5,000. 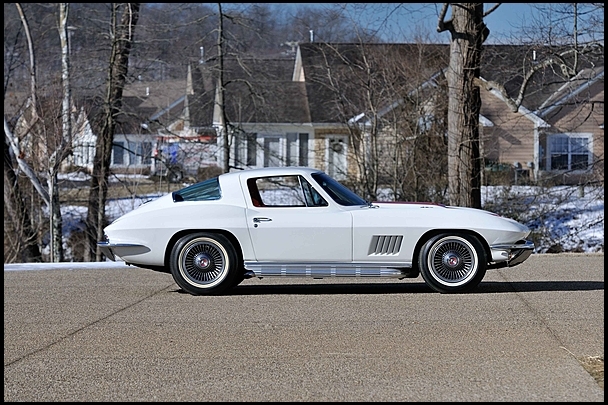 Built on May 10, 1967, and delivered to McNamara on May 20 by Ray Motor Co. in Lamar, the Corvette coupe was exactly as Don had ordered, with the L36 427/390 HP engine, M20 4-speed manual transmission and 3.36 Positraction rear end; tinted glass, telescopic steering wheel, AM/FM radio, side exhaust and bolt-on aluminum wheels. 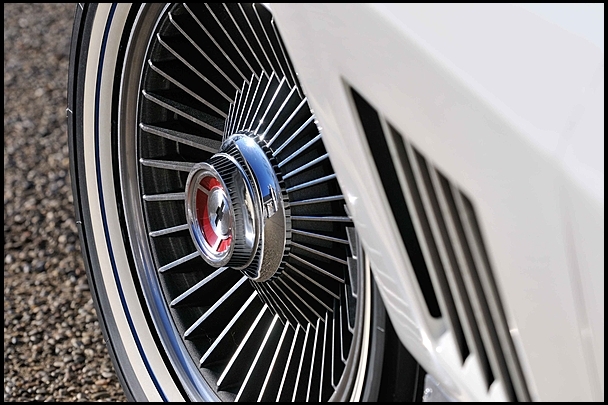 Don’s innate patriotism influenced his choice of colors: Ermine White paint, Red Stinger stripe and Red interior – a matchup he completed by replacing the factory Black wall rubber with a set of double White-and-Blue stripe tires. Recorded interviews with the couple uncovered the story not only of the Corvette but of its enigmatic owner as well. Don McNamara was a unique man, one who loved his country and surrounded himself with its symbols of freedom and individuality while maintaining an intensely private life. He never married or had a family, never had a checking account or a credit card and always presented himself as barely getting by. 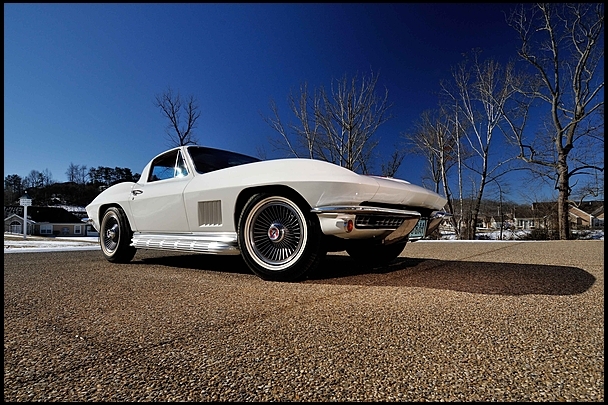 He had decided to put the Corvette under wraps when after the first year the time came to pay license and insurance renewal fees, and began driving it only late at night, away from prying eyes and ever faithful to the pursuit of happiness. When the Corvette’s odometer approached the 3,000-mile mark in the mid-Eighties, he retired it from the road for the rest of his life. 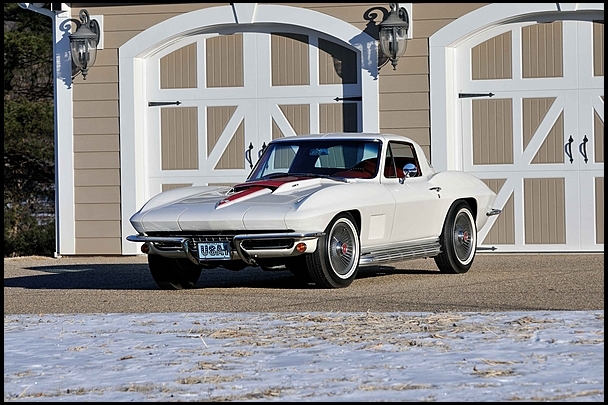 When the Corvette was removed from the garage in 2012, the late McNamara’s next-door neighbor of 22 years saw it for the very first time. It had been discovered wrapped in a car cover, over which was draped a shipping blanket decorated with large Stars and Stripes and Marine Corps flags. 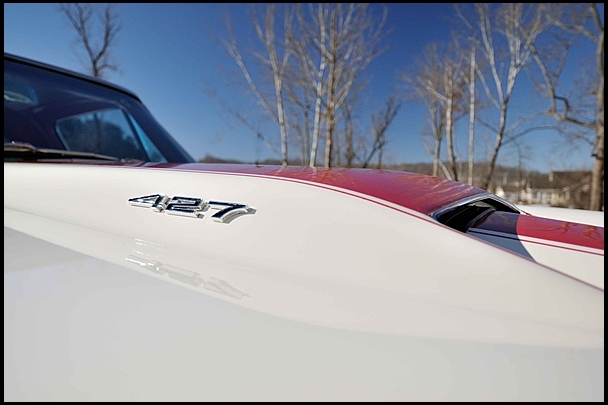 It was in a virtually flawless state of preservation, entirely original except for a few personal touches under the hood comprising polished Edelbrock aluminum valve covers and four Corvette emblems mounted on the air cleaner. 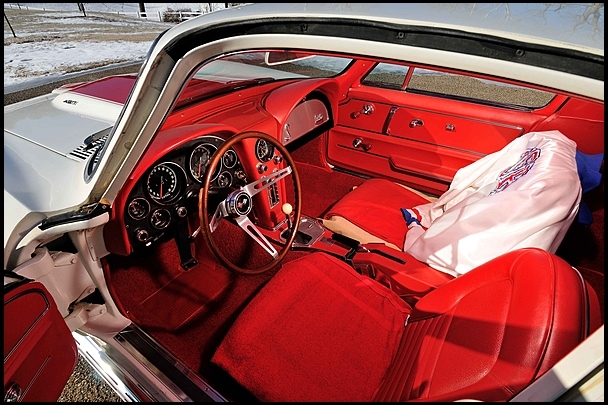 McNamara’s Team USA Olympic jacket was draped over the back of the passenger seat, another reminder of his love of country. The Don McNamara Corvette coupe was purchased from the executors of the estate in 2012 by Dr. Mark Davis, who arranged for it to be unveiled and displayed in the entrance to the Bloomington Gold Great Hall in June of that year. At that time, as now, its odometer showed 2,996 miles. Until its unveiling there, it had been seen by only 12 people. It had only ever been driven by Don McNamara. Only two other people were ever known to have sat in the driver’s seat, and no one had ever occupied the passenger seat. It had never seen the rain or been washed with water and since its discovery had never been cleaned, sat in or touched. 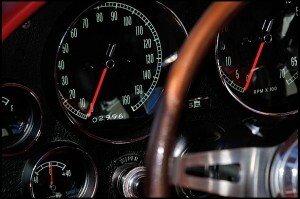 The car instantly caused a sensation in the Corvette community. 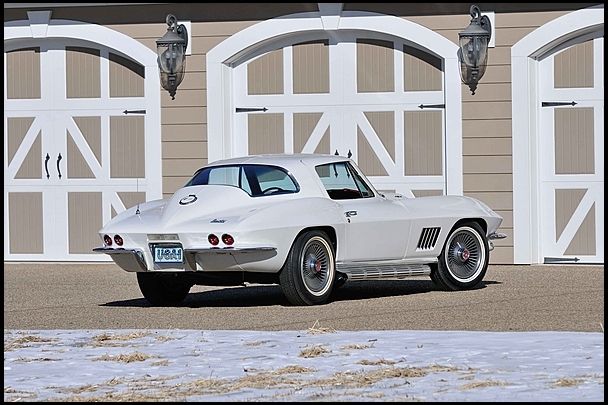 Numerous high profile Corvette experts including John Rettick have thoroughly documented the car with over 4,000 detail photographs, which along with the car itself serve as in-depth educational resources for Corvette restorers. The Don McNamara Corvette is not only quite likely one of the most well-preserved, lowest-mileage and exceptionally original 1967 Corvettes in existence, it is also accompanied by exquisitely unspoiled documentation. The paperwork was kept by McNamara in a bank safe deposit box and remains in crisp as-new condition. It includes the original window sticker, showroom sales brochure, Chevrolet warranty book with Protect-O-Plate, the original keys and fob and a duplicate set of keys; the original owner’s manual and plastic pouch, dealer record book issued by Ray Motor Co., a cashier’s check for a deposit and a receipt for the balance of the purchase price, the original State of Colorado license registration and title issued to McNamara dated May 22, 1967 and the NCRS Shipping Data Report confirming delivery at Ray Motor Company in Lamar, Colorado. Also included are McNamara’s last driver’s license, a photograph of the car he always carried with him in his wallet and video and photos documenting the car’s discovery, its removal from the garage and its unveiling and display at Bloomington Gold 2012. Documentation is contained in two 4-inch binders that also include CDs containing copies of all documents and photos of Don McNamara’s dream Corvette. Last month McNamara’s Corvette sold for $725K at Mecum’s Houston auction.